In this step you are going to make some changes to the HTML files added to your repository in Step 3. Once you make the changes and commit them you can add them to your repository on Bitbucket Server. It's not enough to just make your changes, you have to share them with the world! This step explains how to make a simple change in a source file that you'll then commit locally and push to your personal repository. Open the Teams in Space.html file in a text editor. Find the <h3>Main Menu</h3> line. Within that menu, add another list item to add a link to the itinerary on the Main Menu. (You can copy this code and add it in your HTML file). 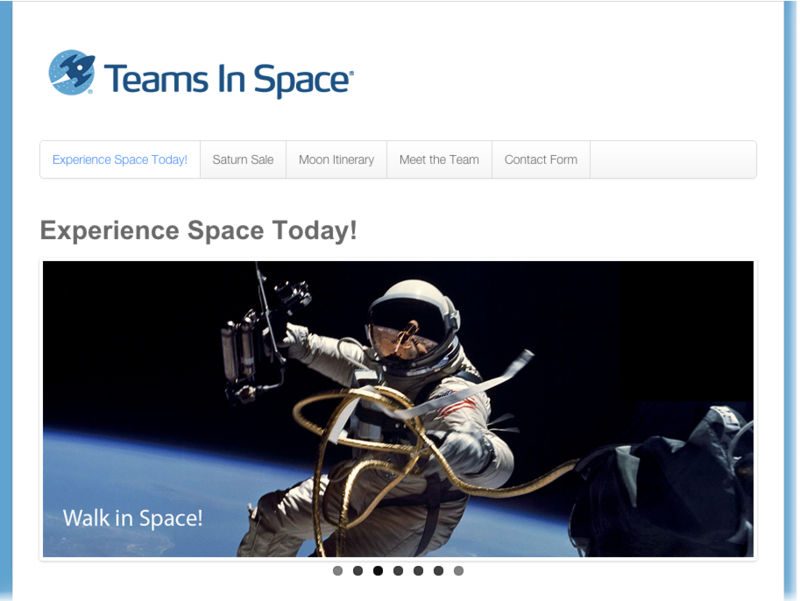 Check your work by going to the Teams in Space.html file and opening it in a web browser. It should now look something like this. Once you've made the changes and verified they work, you'll now commit the changes and push them to your repository. Commit the changes using SourceTree (or the command line). From SourceTree, click on Working Copy in the upper-left. In the Unstaged files pane on the bottom, you should see the Teams in Space.html file. Select the checkbox to left of the file. The file moves to the Staged files pane. Click Commit in the upper-left. The Commit dialog opens at the bottom. Enter a commit message in the text field (something like "This is my first commit!" would do). Push the changes to the repository. There is now an indicator within the Branches field on the left that there are changes to push, as well as on the Push button on the top toolbar. Click the Push button, and make sure the master branch is selected, then click Ok to push the changes. You can verify the changes were pushed by going to the repository and clicking on Commits. Commit the files you changed to your personal repository from the command line. git commit -m "Website changes"